Five years ago, I wrote about Belta’s Farm. Nothing — not a sign or a peek through the trees — indicates that the driveway at #128 leads to a 23–plus-acre farm. 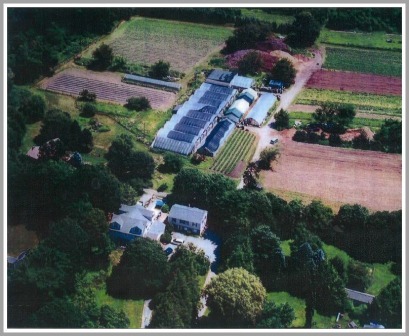 An aerial view of Belta’s Farm from several years ago shows fields, greenhouses, a compost pile (near the top), and the family’s two homes (bottom). Five years later, the farm — which has supplied Stew Leonard’s for decades, and since 2012 offers fresh produce and eggs through Community Supported Agriculture subscriptions — has edged closer to its next chapter. The Belta family cares deeply for its farm, and the neighborhood. As Westport — and their lives — change, they’ve worked hard to come up with a plan they believe will enhance the area, while helping settle their patriarch’s estate. On July 26, they’ll present a proposal for a text amendment to the Planning & Zoning Commission. They hope to create an Agricultural Heritage Overlay District. It will enable them to build 9 single-family homes, on 1-acre lots — and retain 8 acres of the property for use as a working farm. Four generations of Beltas would be able to stay on the land. A site plan for the proposed Agricultural Heritage Overlay District. Over the years — especially after the death of Jimmy Belta in 2012 at age 88 (a farmer to the end) — many developers have approached the family. Each time, they said no. The plans were not in keeping with the Beltas’ concept for the future of their farm and homestead. Provide a buffer area with neighboring properties, and preserve the farm’s natural beauty. Current zoning regulations permit 2-acre lot subdivisions. So they could sell the entire property, to be filled completely with homes. 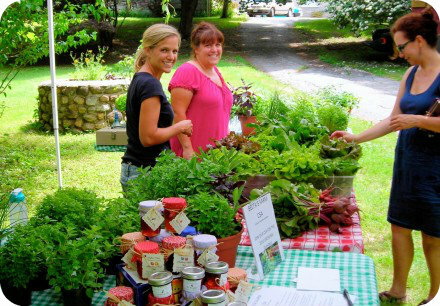 Belta’s Farm Stand provides great produce to Bayberry Lane and beyond. For over 70 years, the Beltas have been good neighbors — and great providers of fresh fruit, vegetables and herbs to Bayberry Lane and beyond. They no longer raise poultry and livestock there. The slaughterhouse is gone. Times change. This time, they’re asking the town to help them move forward. Without leaving their farm behind. The greenhouse and outbuildings, today. 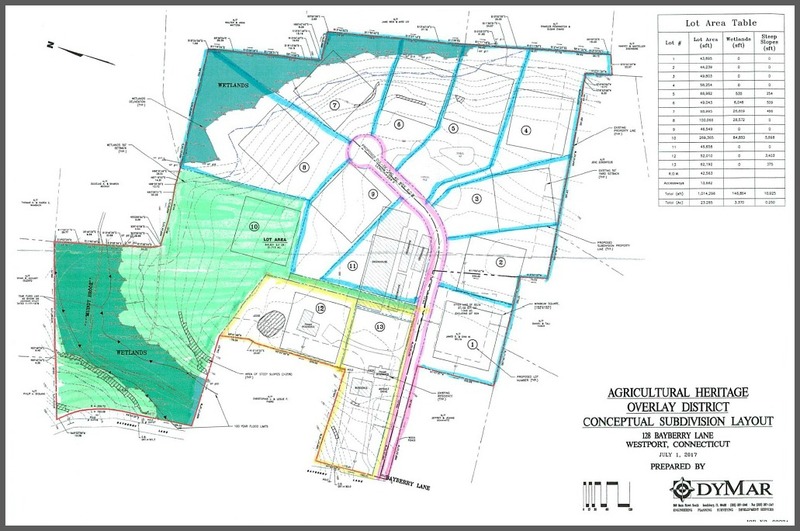 This entry was posted in Environment, Local politics, People, Real estate and tagged Bayberry Lane, Belta's Farm, Community Supported Agriculture, Westport Planning & Zoning Commission. Bookmark the permalink. As you point out, Dan, current zoning regulations permit 2-acre lot subdivisions. How would any of us benefit by reducing zoning in any shape or form? If they want to sell the entire property, keeping the two acre plots, they should do so. Wetlands appears to constitute part of the property and wouldn’t be developed anyway. This proposal does not include any public open space areas. Westport’s Real Property Committee should be involved in how this tract of land is handled. What a great idea. It is a win for the Belta Family and a win for the town. I live on one acre and believe me it is plenty of room. Look at the Gault property. This is much better. This family has been paying taxes for 70 years. I think this should be approved. Dan, The Belta proposal provides for eleven (not nine) single acre lots in a AAA 2-acre subdivision. The neighbors do not benefit from such an arrangement at all. Nor does the remainder of Westport. We wind up with more homes on smaller land all visible from our adjacent properties. The result is more septic systems, a dead end road off of Bayberry Lane below Cross Highway which is already clogged with traffic, and more homes in the congested Long Lots School zone, There is no benefit to the Town of Westport which would flow from this plan. It only benefits the current owners of the farm who to wish to make as much money off the sale of the property as possible. If they wish to continue to farm, they may do so and sell the land off in two acre lots. As it currently stands, the property is the Belta farm, not a town farm. There is no public space upon it. Nor would be open space if the text amendment overlay district is approved. For those reasons and others, all of which we will present to Planning and Zoning, this proposal must be denied. You stated: “The result is more septic systems….” How would the Belta family’s proposal result in “more septic systems” than if the entire property were sold to a developer? Assuming it is correct that 11 new homes will be built there no matter which decision is taken, wouldn’t you prefer to have 11 smaller homes with smaller septic systems than 11 larger homes with larger septic systems? As with my comment to the Schwartz family, I mean no disrespect to you. I only wish to understand if it is correct to say that the Belta’s proposal will result in a larger number of new homes being built on the property. From what I have read, this does not seem to be the case. Are there facts to support your contention that more new homes will be built there if the Belta’s proposal is approved? Wow, What a brilliant proposal and benefit to the whole town by the Belta’s to keep a working farm in perpetuity… and keep the same number of homes that could be built on the whole property. There is no downside, we retain the towns agricultural history and leave the heritage of a farming legacy. I believe it’s even more beneficial than the equivalent of most open space donated to the town. The bonus of making it useful instead of what most open space, hidden and uncared for an overgrown patch no one wanted, allowing the developer some concession that only benefits the developer’s pocketbook. The area of Belta’s farm is littered with different sized properties, many one acre well within the arbitrary 2-acre zoning, it’s clear to me it doesn’t affect anyone’s property values or prevent any sales. Realtors in town speaking to land values have said to me “a building lot is a building lot” many mistakingly believe it means more then it does. Zoning is a tool for the town to make smart choices not a weapon for individuals to prevent something they mistakingly believe to be true. I’m confident the zoning board will thoughtfully decide in the whole town’s best interest. Thank you Belta family for your thoughtfulness. Two acre zoning should stay two acre zoning and should not be manipulated for any one family’s benefit. Our neighborhood used to be an onion farm, and given the 2 acre zoning, was developed in the 1960s into homes on 2 acre lots. Does the town want all of us within 2 acre zoning to apply for subdivision into one acre lots? Given the small size and age of our home, we would make more money by selling it as 2 one acre lots to a developer. But the school system and roads will be inundated if the town allows this to happen selectively all over Westport! As a Bayberry Lane resident who regularly enjoys the fruits of the Beltas’ labors, I think their proposal is a fantastic idea. It would be great to have the farm stay a farm in perpetuity. The cluster type approach to the use of a portion of the land with one acre lots seems an ideal alternative to someone buying all of the land, clearing the trees and losing forever what I believe to be a Westport treasure. And maybe I’m missing something, but I don’t see how this proposal enhances the area. In what way does building and selling private homes nearby “complement” the farm property? I’m thinking the Density Debacle at Daybreak has emboldened everybody. If we’re going to change our zoning rules so everyone can subdivide like crazy to max out the value of their property, that’s one thing. But to keep doing it selectively — in this case, just because we like the idea of a farm off Bayberry — strikes me as odd. I hope, at the very least, the family or developers will offer to donate some of this land as open space with access, so that the proposal becomes a win-win proposition and all Westporters — not just those who want to pay for the Belta’s produce — can benefit from keeping this local farm. Ah, here’s a chance for the real “heart of Westport” to show itself. This is a great way to incorporate the old and the new. I’m afraid there will be some NIMBY, but this is a win-win situation for the Town. For people who have paid a lot of taxes over 70 years, let’s find a way for them to continue farming without going broke. Great idea! The Beltas are correct: this is a unique land use concept-BUT- it will only benefit the Beltas. Not the town of Westport, and CERTAINLY NOT the close neighbors of the current Belta farm. If the proposal for an “Agricultural Heritage Zone” (a just coined concept) is accepted, the only possible beneficiaries are the Beltas. There is no other parcel of privately owned land within Westport that qualifies under the parameters of the proposal! Such an arrangement is called “Spot Zoning”- and should not be permitted. a. They can remain living on their property, and at a VERY reduced land tax rate. b. They hope to attract a developer who will pay more-because more homes can be built on one acre parcels than on two acre parcels. The Beltas are free to both remain living in their homes and continue farming AND/OR sell off their property at two acre zoning without jeopardizing the home values and atmosphere of the area near the farm. acre area by 50%! While it is understandable that the Beltas want to maximize their own wealth, it should not come at the expense of their neighbors! What “expense” to the neighbors? From what I understand, the plan calls for 11 new homes on 15 acres, and leaves 8 acres for the Belta’s farm and their existing two homes. If a developer buys the entire 23 acres, 11 new homes will be built. Both proposals result in 11 new homes, with the difference being in the homes’ square footage and acreage. If the two proposal resulted in double the number of houses to be built, I could understand fully why you would object. I do not mean any disrespect to you, but would you mind to explain why you would prefer 11 new (larger) homes and no farmland to 11 new homes plus 8 acres of farmland? I suggest you read the comment by Mike Freedman posted here. Additionally, realize that not all 23 acres would be available- as there would need to be roads built- and the Beltas wish to retain not one but two homes for themselves. This means that 11 one acre homes would be crammed into the remaining space. This would dramatically change the secluded ambiance – and value-of this AAA zoned area-the appeal of which is one of the major reasons most of us chose to purchase our properties here. For all with additional questions, please attend the meeting on 7/26 when all aspects will be discussed. As “feel good” as the idea might sound off the bat, there’s no legal or practical justification for allowing such an exception. This amazingly cynical, incredibly narrowly construed text amendment for a buzzword laden “Agricultural Heritage Overlay District,” seemingly benefits nobody in Westport other than the Belta’s. On a quick search, there are no other properties in all of Westport that this Overlay District would work for, and the Town has already spent town time, energy and money investing in keeping its agricultural heritage in tact at the Town’s own Wakeman Farm less than a mile from the Belta property. Additionally, there is another working farm about a quarter mile from the Belta Property on the Pabst Property, and a number of years back the owners of that property abided by the zoning in the area and sold off parcels of their own property while adhereing to local zoning regulations. The Belta’s are attempting to pull off the triple salchow of development on their property; they are trying to retain their homestead plus seemingly adding another home; they are trying to retain their highly beneficial tax designation currently bestowed upon them as a working farm; and they are trying to change the Zoning in this historically AAA zoned area to AA to max out their properties development potential. The Belta family have been good neighbors to us for the past 25 years, but we bought our property specifically because it was set in a AAA Zoned area. They are more than free to develop their property in any way they deem fit as long as it conforms to the zoning that we all live with. Absent that, the benefit to the Town of a smaller tax base if developed according to their Plan, with more congestion, and more density, on already crowded Bayberry Lane, on a very difficult corner, is beyond me. Whatever the case, I would request all citizens of Westport to take a look at all the facts either way on proposed developments in your, and other areas of Town. It is our town to help form, and only through civic involvement can all voices be heard. Whether the Belta family is allowed to subdivide as proposed, or sells in entirety to developers, the end result will be 11 new homes on the property. One-acre homes will be smaller than two-acre homes and will have smaller septic systems, footprints etc. For this reason (i.e., 11 new houses either way), the town should allow the Beltas to carry out their plan. In exchange for the concession, the eight-acre portion that contains the Belta family home must remain farm land or otherwise undeveloped in perpetuity and cannot be subdivided. As far as wetlands are concerned, whatever is built there should adhere fully to the town’s wetland regulations. I’m sure the neighbors who are complaining will be much happier when a developer comes in with a low income housing proposal, and therefore won’t be subject to local zoning laws. One way to use this property to “preserve the character” of Westport is for the town to buy it and put up 300 affordable housing units in order to clear our 8-30g obligations so the rest of the town can be spared. The integrity of the Belta family is solid. Mr. and Mrs. Belta senior were friends and colleagues of my parents and very well respected in town and throughout CT. They’ve been the part of the fabric of this town for 80 (or so) years and their work ethic is incredible. The plan they’re proposing is reasonable, and, it is a fantastic idea. Many of the properties around them predated the 1960s zoning change from a one acre zone to a two acre zone and were developed on one acre. I wholeheartedly support this plan and the Belta family. Great people. Great plan. it is the best blog from all of this thanks for sharing this type of blog.. Certainly there are legitimate concerns with and legitimate benefits of this proposal. They will be aired before the P&Z Commission and all with thoughtful views should express those by public comment or e mail to the Commission. My initial concerns are with the “public benefit” of the re-zoning, including public access to the farm and if the farm ever disappears, the use of the land for a public space, e.g. a Town park. I also do not want to see anyone suggest that the houses on one acre lots be placed on sewers. This site is well outside the “blue line” and it is crucial that the “blue line”, the line that allows or precludes sewers, be kept just as it is. Septic systems work on two acre lots and if there is any possibility a septic system will not work on these one acre lots which also must not be allowed to be used for “McMansions”, including well into the future, the re-zoning to one acre sites should probably never be allowed. 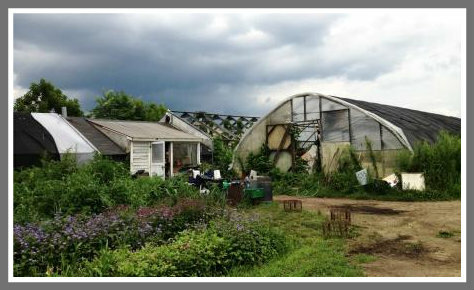 The preservation of a farm is of course desirable, as is increased public space. Belta’s farm used to be in a one acre zone and then one day, in 1966, the town decided to change it to two acre. Land owners were stunned. The change was immediate and in fact, it was retroactive. Any undeveloped land, even lots that had already been legally subdivided, owned by the same person, were redrawn into two acre lots, and people immediately lost half of the value of their land because they had half the number of lots. It was the biggest land grab in Westport’s history, even worse than making a double front set back on corner lots. The Belta’s deserve this and should have it.